The Location Managers Guild of America (LMGA) held their second annual LMGA Awards last Saturday, March 7, 2015, at the Wallis Annenberg Center for the Performing Arts in Beverly Hills. The prestigious LMGA Awards honor the outstanding and creative contributions of location professionals in feature films, television and commercials. We're not surprised to hear about this year’s winners. The end results speak volume for their excellence. Nancy Haecker, location manager for Wild, took home the honor for Outstanding Locations in a Contemporary Film. Filmed mainly in Oregon and aong the Pacific Crest Trail, Wild is memorable not only for its story and acting (Reese Witherspoon), but also for its gorgeous, magnificent Oregon film locations. Ms. Haecker has also worked on many other films and television productions, among them are Kill Bill (Vols 1 & 2), Into The Wild, House M.D., and The Judge. Klaus Darrelmann - "The Grand Budapest Hotel"
Klaus Große Darrelmann, location manager for (my personal favorite) The Grand Budapest Hotel, received the trophy for Outstanding Locations in a Period Film. Shot entirely on location in Germany (Gorlitz and surrounding areas), The Grand Budapest Hotel is forever memorable in our hearts and mind (check out our blog article The Magnificent Film Locations of The Grand Budapest Hotel). Mr. Darrelmann has worked on numerous other productions, including The Hunger Games: Mockingjay - Parts 1 and 2, Hansel & Gretel: Witch Hunters, Cloud Atlas, The Bourne Ultimatum, Mission: Impossible III, and Inglorious Basterds. Batou Chandler - "True Detective"
Matthew McConaughey and Woody Harrelson in True Detective, filmed in Lousiana - image via Google. Batou Chandler, the location manager for True Detective, won the award for Outstanding Locations in a Contemporary Television Series. True Detective is a critically-acclaimed American crime drama series by HBO that premiered on January 12, 2014. Created by Nic Pizzolatto, Season One of True Detective follows two homicide detectives (Matthews McConaughey and Woody Harrelson) of the Louisiana State Police as they pursue a serial killer over a period of 17 years. Season one of True Detective was shot in southern Louisiana because of the generous film tax incentives and the state’s unique, contrasting landscapes. "There's a contradictory nature to the place and a sort of sinister quality underneath it all," noted Pizzolatto. "Everything lives under layers of concealment. The woods are thick and dark and impenetrable. On the other hand you have the beauty of it all from a distance." Ms. Chandler has worked on numerous productions including 12 Years a Slave, The Butler, Killing Them Softly, and The Mechanic. Amanda Foley Burbank & Audra Gorman - "Boardwalk Empire"
Steve Buscemi as Enoch "Nucky" Thompson in Boardwalk Empire, filmed in and around New York City - image via Google. Amanda Foley Burbank and Audra Gorman, the location manager for Boardwalk Empire, won the award for Outstanding Locations in a Period Television Series. Boardwalk Empire is a Primetime Emmy Award-winning series by HBO created by Terence Winter. Set in Atlantic City, New Jersey, during the Pohibition period, Boardwalk Empire is an American period crime drama inspired by the book Boardwalk Empire: The Birth, High Times, and Corruption of Atlantic City by Nelson Johnson, about the criminal kingpin Enoch L. Johnson. With its pilot episode directed by Martin Scorsese, Boardwalk Empire immediately won over the public and has been receiving widespread acclaim. 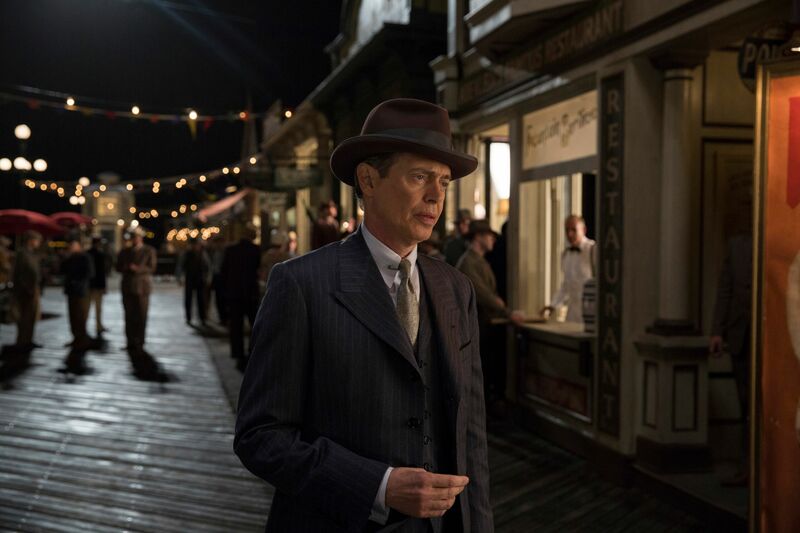 Filmed mostly in and around New York City and its surrounding areas, Boardwalk Empire is famous for its sumptuous visual backdrops. Ms. Gorman has worked on numerous productions including Mr. & Mrs. Smith, The Departed, Click, Music and Lyrics, and Running Wilde. Ms. Burbank has also worked on many productions, such as Hanna, Burn After Reading, The Bourne Ultimatum, and Life on Mars. The winners from left to right: Nancy Haecker (Wild), Klaus Darrelmann (The Grand Budapest Hotel), Batou Chandler (True Detective), Amanda Foley Burbank and Audra Gorman (Boardwalk Empire). Images via LMGA's Facebook page. Other LMGA Awards winners include COCA-COLA “America is Beautiful” (Jimmy Ayoub, Cyndy McCrossen, Peter Orth, Stephen Pherigo) for Outstanding Locations in a Single Commercial, RAM TRUCKS (David McKinney and Peter Orth) for Outstanding Locations in a Commercial Campaign, and the City of Long Beach Office of Special Events and Filming for Outstanding Film Commission. Congratulations to all the much-deserved LMGA Awards winners! You’ve inspired us to watch these outstanding films and television series ... again. PHOTO CREDIT: Banner image of Wild - via Google.